Last month, the Japanese wrestling legend, who reportedly converted to Islam in the 1990s, announced that he’s changed his name to Muhammad Hussain Inoki. Under the banner of his new moniker, Inoki is now making his mark outside the wrestling ring by championing worldwide peace and “international brotherhood” on a global stage through sports and investment in youth. 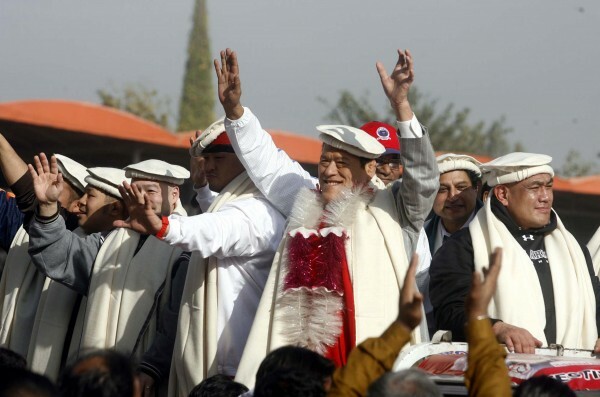 Long known for his passion for peace-brokering on behalf of his native Japan, Inoki — who, in 1990, was sent as a special envoy to Iraq to negotiate with Saddam Hussein over the release of Japanese hostages — visited Pakistan in December to take part in an international peace wrestling competition and to celebrate 60 years of sporting relations between Japan and the South Asian nation. Inoki, who identifies himself as a “peace ambassador,” was also in Pakistan to set up a government-backed wrestling academy, Pakistan’s The Nation reports. 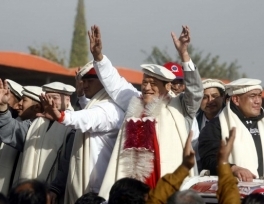 Inoki, who says he practices both Islam and Buddhism, has also become an emblem of religious tolerance, garnering support for his faith from all corners of the globe. Earlier that same year, Inoki had faced off with Muhammad Ali, in what the Guardian described as a “prototype mixed martial arts fight” in Tokyo. Ali wore gloves, Inoki didn’t. The two essentially competed for the title of “toughest man on the planet.” The fight ended in a tie. When Inoki was in Pakistan last month, the Express Tribune reports that he paid homage to his old opponent Pahalwan by visiting his grave. He also talked about his conversion to Islam and mentioned his old foe and fellow Muslim convert, Muhammad Ali (formerly Cassius Clay). “When I converted, people suggested that I change my name to Muhammad Ali but I turned down the idea as I had already fought against the great boxer Ali,”he said, according to Dawn.com. During his trip, Inoki — who in 2010 became the first Japanese person to be inducted into the World Wrestling Entertainment’s Hall of Fame – also said that he hopes to help further strengthen the diplomatic ties between Pakistan and Japan, and to continue bringing the message of peace around the world.